So I have a new TV obsession, It happens, I love things a bit to much and become obsessed, but I am thinking a Doctor Who Part on Nov. 23rd 2013. Doctor Who Food, Doctor Who Drinks, and You Dress As Your Favorite Doctor Who Character… But alas all my local peeps are not excited as I am, which leaves me sad…. 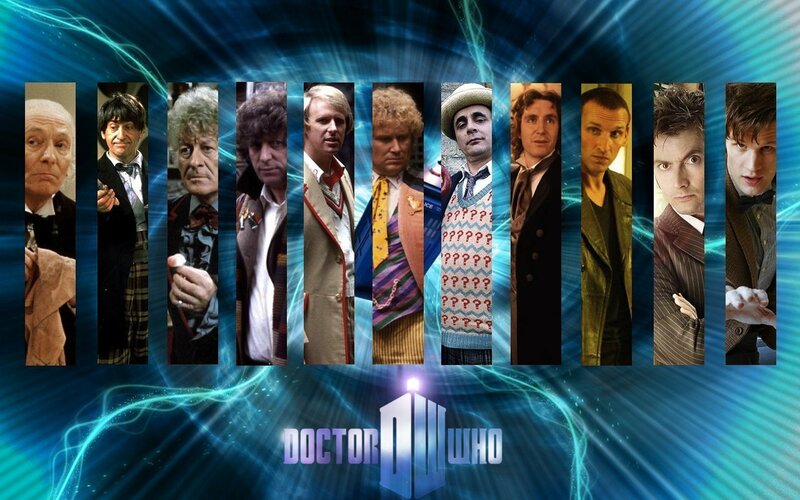 Well here is a picture of the Doctors I found online…. I am totally failing and it doesn’t help that friends bring me chocolate covered pretzels! So seriously after today totally dead set on my diet anybody mentions anything gooey and tasty they will pay the price! Just Kidding, but seriously…. As well as writing and publishing I started (again) a serious diet and I think documenting it will work to help me because my goal is to get a size M of this 10th Doctor Coat!!!!! So Today is the start of the new diet 🙂 Today I have had some Real UnJunk Chocolate about 70 calories and a Venti Skinny Vanilla Iced Latte for 270 Calories. Wish Me Luck!